The fast and easy way to kill weeds and grass just got easier. Ready-To-Use Refill for any Roundup® Ready-To-Use Weed & Grass Killer III applicator. Great for refilling your Comfort Wand®, Sure Shot® Wand or Pump 'N Go Sprayer. There's no mixing and no measuring! 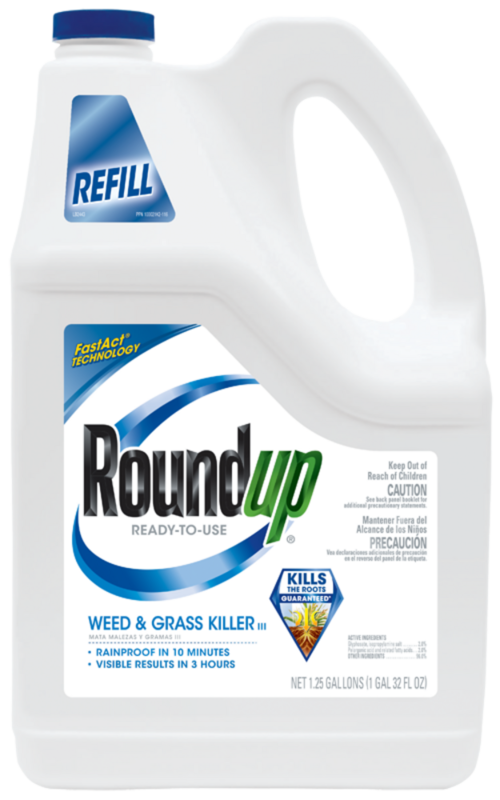 The Roundup® Weed & Grass Killer III Refill is ready-to-use so there is no mixing and no measuring. There is no worry that you've mixed your refill too weak or too strong because it's already mixed to the perfect ratio for you! May be used around vegetable gardens. Also use on patios, walkways, driveways, gravel and mulch beds, around shrubs or trees, in flower beds and along fences. All ornamental flowers, trees and shrubs may be planted one day after application. Lawn grasses, herbs, vegetables and fruit can be planted 3 days after application. The main active ingredient in Roundup® Weed and Grass Killer products is glyphosate. It works by targeting an enzyme that is essential to plant growth.